This tutorial is an update of a post I originally wrote in 2013. It’s one of the most visited pages on our website and a recent comment prompted me to create an updated post with a solution that works with the latest version of jQuery and uses a modal plugin that is still supported. This was originally created as an alternative to adding a plugin and is designed to be lean and lightweight. The requirements and functionality are quite simple. However, by using Advanced Custom Fields (ACF) you can pretty much make this support whatever fields or media you require. Please note for this example I’ve added the functionality to an Options panel. If you want to do it this way you’ll need the Pro version of the plugin, however it can be implemented on the free version. 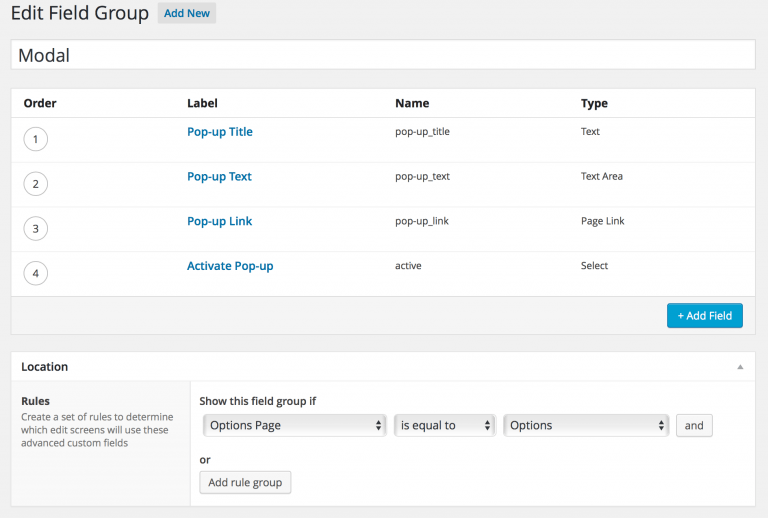 First step is to create the custom field group. The example here contains a few standard field types, including a select field. This was added to enable the user to switch the modal ‘on’ and ‘off’ as required, it also ensures that we can control the loading of the supporting js & css which eliminates the loading of unnecessary resources if it’s not in use. The following are added as choices to the ‘Select’ field. When using ACF I always take advantage of the local json support. If you want you can download the json file here and add it to a ‘acf-json’ folder in your theme. Once add the field is set-up you can then enter the content for the modal in the options panel. As mentioned prior the active state of the modal is controlled by a select field. In this example I only want the modal to be active on the home page of the website, so the following was added to the header.php template. 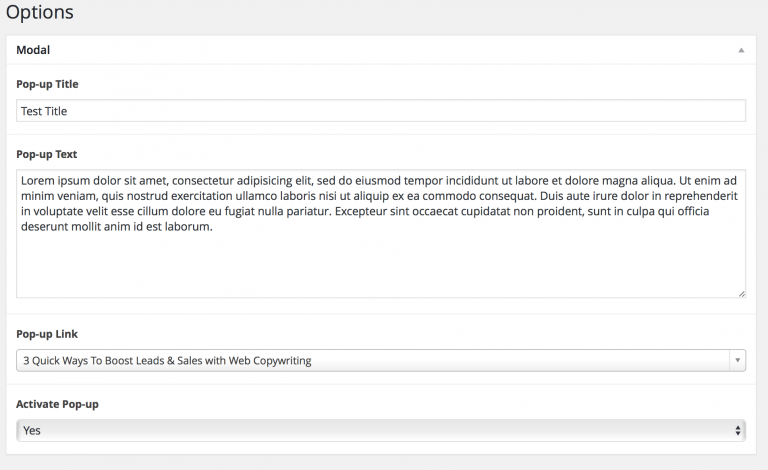 Next the modal.php template was created to display the ACF fields. jQuery Modal is the plugin that I’m using for this example. It was chosen because it is extremely simple & lightweight. Add the following to the functions.php file. You’ll need to update the file path for ‘jquery.modal.min.js’ as required. In this example I wanted the modal to fire 2 seconds after the page loaded and only on the home page. To achieve this I needed to modify the jQuery function from the default ‘on-click’ option and added the following code to the footer.php template in the theme. The end result is a simple, lightweight and flexible solution that can be easily modified to suit a variety of requirements. The ‘jQuery Modal’ plugin comes with a very simple and lightweight css that is perfectly fine for styling. However, for the example shown above I created a sass file that you could easily be transferred between projects. I’ve added this below. Is there a way to implement a modal popup on click, versus by time? I’d like to implement this for multiple sections of the site. Thanks! The “rel” tag will open the modal by ID and is simplest way to work with the default jQuery Modal plugin settings. This also means the js in step 4 would be redundant and no longer necessary, so you can remove it from your theme. Is there a way to adjust this to be cookie-based? I’d like to set it up so that the popup doesn’t appear every time the user goes to a new page. // IF cookie has been submitted do nothing. I seem to be having issues getting this to work on my theme. I’m using the exact method you describe above first, then I’m going to try to add the cookie element to it. Where in the header.php file should the get template part (‘modal’) go?
. It doesn’t need to be in the header it can be in the page.php or footer.php. If you extend it to include the cookie the best thing would be to add that script to the WP function (step 3) and then use the two js functions I posted in the last comments as an edit to step 4. (also remember to remove the if(is_frontpage()) conditional if you want it to appear on any page. You need to wrap the modal function within the cookie function as that is the parameter you want to use to determine whether the modal shows.